If you notice unauthorized Visa charges on your account, you may have become the victim of Visa debit card fraud. Click here to download documents to help you get started with the resolution process. Gulf Coast Educators FCU will NEVER email or call you asking you for sensitive information such as PINs, Social Security Numbers, etc. You should NEVER respond to any emails or phone calls requesting this type of information. Delete these emails or hang up immediately. Anytime you receive an email or phone call of this kind, please feel free to report it to the credit union call center at 281-487-9333. A skimmer is a device that is placed over a card reader, that scans your card information as it passes through. Thieves use these devices to steal your debit or credit card numbers, and make purchases with them at a later date. They are often placed on gas station fuel pumps, and are not easily detected. If you have scanned your card through a skimmer, chances are you won’t know until you start seeing fraud on your account. Too many times, these devices are placed and not detected for weeks or months. This is why it is crucial to always keep an eye on your accounts, and make sure that every transaction is one that you made. It can be almost impossible to tell if skimmer has been placed on a card reader. However, there are steps you can take to protect yourself. Take A Closer Look – Check the card reader and machine for evidence that it has been tampered with. If there is an area that looks like it has been pried open, that is an immediate red flag. If the card reader itself looks bulky or out of place with a different color or material than the rest of the machine, that could be another sign of a skimmer. Check The Sticker – Many gas stations are now putting stickers on their fuel pumps. If the sticker is torn, do not use that fuel pump. Even if there is a separate sticker placed that is not broken, you should not trust it. Be Aware – Always be observant of your surroundings anytime you are making a purchase. 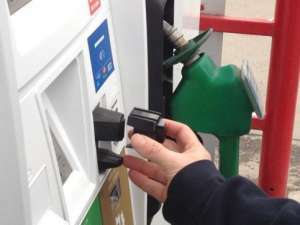 If you are at a fuel pump or ATM, take a glance at the other machines nearby to see if those look similar to the one you are using. If not, don’t use either one. Hide Your PIN – Along with the card reading devices, thieves will place a fake keyboard or camera nearby to capture your PIN. Anytime you enter your PIN, you should do so as if someone is looking over your shoulder. 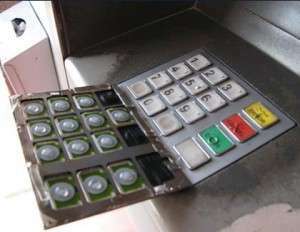 Cover the keypad with one hand as you enter your PIN with the other. If you notice anything suspicious, you should immediately report it to the business. If you believe you have been a victim of debit/credit card skimming, please give us a call at 281.487.9333. Recently, some of our members have reported receiving calls that appear to be from themselves. When answered, there is a recording claiming to be the member’s cell phone provider. The recording goes on to say that there is fraud on their account, and to enter the last 4 digits of the primary account holder’s social security number. These calls are not actually from cell phone providers, but from scammers. In any case, you should never give out your personal information to a person or recording that has called you. The above situation is an example of “spoofing,” or when a scammer sends false or misleading information in an attempt to deceive the receiving party and/or hide the caller’s true identity. If you encounter this type of situation, you should hang up and call the phone number listed on your account statement, or on the company’s website to find out if they do, in fact, actually need that information. If the “spoofed” Caller ID displays your own number or a similar number to your own, do not answer. In any case of spoofing, you may file a complaint at www.IC3.gov. Last week Equifax announced that a cybersecurity incident occurred, potentially impacting approximately 143 million people. The unauthorized access occurred sometime between mid-May through July 2017. What You Need To Know – Names, Social Security numbers, birth dates, addresses, and some driver’s license numbers were compromised. In addition, if an individual had contacted Equifax during that time to place a freeze/unfreeze on their credit report, their debit or credit card information was potentially exposed as well. What You Need To Do – The credit union has already been in contact with the members whose debit and credit card information was compromised. If you have not been contacted, you do not need to get a new card. All members should be cautious going forward, and monitor your credit report for suspicious activity. Equifax has established a dedicated website, www.equifaxsecurity2017.com, to help consumers determine if their information has been potentially impacted and to sign up for credit file monitoring and identity theft protection. The offering, called TrustedID Premier, includes 3-Bureau credit monitoring of Equifax, Experian and TransUnion credit reports; copies of Equifax credit reports; the ability to lock and unlock Equifax credit reports; identity theft insurance; and Internet scanning for Social Security numbers – all complimentary to U.S. consumers for one year. For more information on the Equifax breach, you may visit https://investor.equifax.com/news-and-events/news/2017/09-07-2017-213000628. In the past several months the crime of “bank jugging” has been on the rise in Harris County, including the city of Pasadena. The Pasadena Police Department Auto Crimes Unit offers the following information on what “bank jugging” is, what citizens should be on the lookout for, and things they can do to protect themselves from becoming a victim. The term is used to describe suspects who sit in bank parking lots and watch customers go in and out of a bank. The suspects follow the customers they believe are in possession of cash and look for an opportunity to burglarize their vehicles or rob them directly. “Juggers” most frequently target customers carrying bank bags, bank envelopes and coin boxes. Most “jugging” Burglary of Motor Vehicles occur at a retail or commercial business the customer stops at after leaving the bank. If a customer leaves the bank and does not leave their money unattended in the vehicle most “Juggers” will go back to the bank to target another banking customer; however, some “Juggers” will confront the customer in an attempt to rob them by taking the money by force. Conceal money before leaving the bank. Never openly carry bank bags, envelopes or coin boxes. If you suspect you are being targeted, call 911 from your cell phone and keep the dispatcher informed of your location, the direction you are traveling, and drive toward the police station until marked police cars are able to locate you. Do not leave or try to hide your bank bag or bank envelope in your vehicle when you exit at your next destination, even if it’s your residence. It has come to our attention that fraudsters are using counterfeit Gulf Coast Educators FCU Official Checks in conjunction with a number of scams including secret shopper, work at home, property rental and business offers scams. All of the scams have a common request for the check recipient to cash the check and send a portion of the funds to the check sender via western union or moneygram. A copy of one of the counterfeit check appears below, but several variations are being used. Our official checks are not printed on this stock from VersaCheck. If you have any questions about one of our official checks, please do not hesitate to contact us. 1/11/14 Credit union members are reporting an increase in the number of phishing e-mails and phone calls they are receiving in the wake of the Target breach. Here is an example of a recent e-mail received by one of our members. Notice what happened when we posted the message in Word. Click image to view message. As far as the phone calls are concerned, members report that the call states their card has been blocked and to push 1 to provide further information. We do have an outsourced Visa Fraud system that does make calls to help our members prevent fraud on their accounts. The legitimate calls will never ask for sensitive information. The numbers from which the calls will come is 877-253-8964. You can call the number listed with confidence that it is legitimate. Unless the calls come from this number or the credit union directly, members should consider the call fraudulent. We have confirmed that other area credit unions are experiencing the same type of fraudulent activity. We will be closed on Monday in observance of Columbus Day but will be available today between 9 AM and Noon and again on Tuesday beginning at 8 AM. If you have received such a call and did provide information, please call 800-472-3272 to have your card cancelled immediately. We do have an outsourced Visa Fraud system that does make calls to help our members prevent fraud on their accounts. The legitimate calls will never ask for sensitive information. The numbers from which the calls will come is 877-253-8964. You can call the number listed with confidence that it is legitimate. Unless the calls come from this number or the credit union directly, members should consider the call fraudulent. Follow us on twitter to receive fraud warnings and tips during National Cyber Security Awareness Month. The IC3 receives a high volume of complaints from victims of payday loan telephone collection scams. In these scams, a caller claims that the victim is delinquent in a payday loan and must repay the loan to avoid legal consequences. The callers purport to be representatives of the FBI, Federal Legislative Department, various law firms, or other legitimate-sounding agencies. They claim to be collecting debts for companies such as United Cash Advance, U.S. Cash Advance, U.S. Cash Net, and other Internet check cashing services. One of the most insidious aspects of this scam is that the callers have accurate information about the victims, including Social Security numbers, dates of birth, addresses, employer information, bank account numbers, and names and telephone numbers of relatives and friends. The method by which the fraudsters obtained the personal information is unclear, but victims often relay that they had completed online applications for other loans or credit cards before the calls began. The fraudsters relentlessly call the victim’s home, cell phone, and place of employment. They refuse to provide to the victims any details of the alleged payday loans and become abusive when questioned. The callers threaten victims with legal actions, arrests, and in some cases physical violence if they refuse to pay. In many cases, the callers even resort to harassment of the victim’s relatives, friends, and employers. These telephone calls are an attempt to obtain payment by instilling fear in the victims. Do not follow the instructions of the caller.